Stainless Steel Sgfkepl Three Burner Range, Size: 60" X 18" X 26"
Size: 60" X 18" X 26", 60" X 18" X 26"
We are engaged in manufacturing premium quality range of stainless steel three burners Steel Gas Stove. 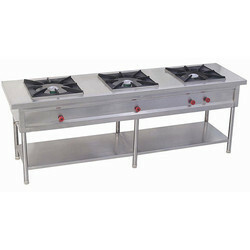 This Steel Gas Stove range assists in cooking process and is used in hotels, restaurants, fast food centers and canteens. This Steel Gas Stove is also innovative and can be designed as per client's specifications and industrial needs. The entire range is offered at market leading price range. - C.I.Casting: Dom Type. 14"x14"x4"H 2 peace. Flat Jali type 8"x8"x1"H 1 peace. 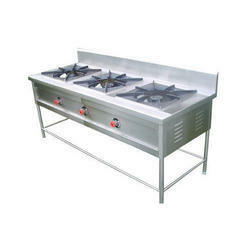 We are a renowned firm of 3 Burner Gas Range that is extremely used in various industries. We are actively involved in providing an extensive range of Chinese Cooking Range. Due to high demand, professionals develop these products in varied specifications that meet on client’s demand.